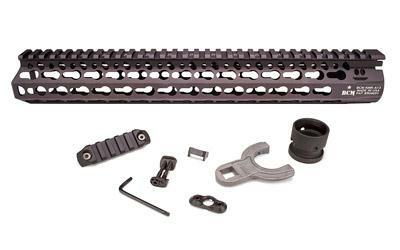 Home > AR-15 Parts > Rails and Handguards > Bravo Company Gunfighter Alpha KMR Keymod Handguard 13"
Bravo Companys KMR Alpha KeyMod Handguard is a 13" long free floating handguard with all the advantages of the original KMR but now made of 100% aluminum making it incredibly lightweight yet strong. The handguard itself weighs 7.7oz! This is definitely one of the best Keymod handguards. One of the lightest on the market and the quality is top of the line. I have two of these, one on a 16" barrel and the other on a 14.5". I also have a 15" version on an 18" barrel. No problem with the handguard clearing a BCM gas block, Faxon gas block or a Yankee Hill gas block. Installation is easy and the instructions are excellent. It includes a wrench that helps with installation. Highly recommended.